Whey Protein Concentrate, Cocoa (processed with alkali), less than 2% of: Natural and Artificial Flavor, Salt, Soy Lecithin, Carrageenan, Xanthan Gum, Acesulfame Potassium, and Sucralose. 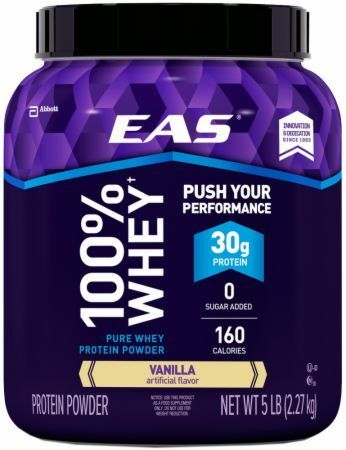 Whey protein concentrate; Less than 2% of: natural and artificial flavor, salt, soy lecithin, carrageenan, xanthan gum, acesulfame potassium, sucralose, and red 40. Combine 2 scoops with 8 fl oz of cold water, milk, or your favorite beverage and mix for 20-30 seconds in a shaker or blender. Enjoy as a snack or post-workout combined with a healthy diet and exercise program. Whey Protein Concentrate, less than 2% of: Artificial Flavor, Salt, Soy Lecithin, Carrageenan, Xanthan Gum, Acesulfame Potassium, and Sucralose. New upgraded formula with an awesome new taste driven by quality proteins and flavor system. 2.9g L-Leucine, a BCAA to help build muscles. Leucine helps stimulate muscle protein synthesis. 26g whey protein isolated through a series of micro- and ultra- filtration steps and "instantized" for ease of mixability. 100% Whey Protein is pure, "Instantized" whey protein processed through a series of low-temperature micro- and ultra-filtration steps, producing the cleanest, most intact form of whey protein available. This careful processing means that 100% Whey Protein is designed to provide the highest biological value protein available from any single protein source. It also means that the greatest possible concentration of bioactive microfactions is preserved. These microfractions are vital for promoting whey protein's famed immune enhancing effects. Pure, clean whey protein is also absorbed into your body faster than any other protein. 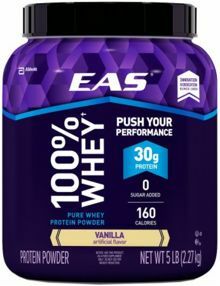 Finally, a protein supplement that works as hard as you do - 100% Whey Protein by EAS.